↑ For the ancient Greeks, convinced that Theseus had actually existed, he was not mythic, of course, but legendary. ↑ See Carl A.P. Ruck and Danny Staples, The World of Classical Myth (Carolina Academic Press, 1994), ch. ix "Theseus:Making the New Athens" pp 203–22: "This was a major cultural transition, like the making of the new Olympia by Hercules" (p. 204). 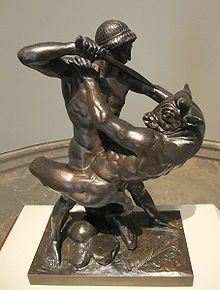 Price, Anne, The Quest for Theseus (London, 1970) examines the Theseus-Minotaur-Ariadne myth and its historical basis, and later treatments and adaptations of it in Western culture. Ruck, Carl A.P. and Danny Staples, The World of Classical Myth: ch. IX "Theseus: making the new Athens" (1994), pp. 203–222. Walker, Henry J., Theseus and Athens, Oxford University Press (US 1995). The most thorough scholarly examination of Theseus's archaic origins and classical myth and cult, and his place in classical literature.